Best used bookstores in the capital region? And if you do have a place to suggest, please explain why it's worth a stop -- wide selection, interesting finds, cheap prices, good trade-in policy, whatever. Dove and Hudson, at the corner of Dove and Hudson Streets in the Hudson/Park neighborhood of Albany. A small used bookstore with a well-curated selection and inviting atmosphere. Wonderful on a rainy afternoon. My hands-down favorite bookstore in the Capital District is the treasure trove that is Dove and Hudson Used Books in Albany's Center Square. While smaller than most used bookstores, the owner meticulously maintains an amazing collection of high quality, well-priced books on a variety of topics. If you're looking for dog-eared romance novels, this isn't the place, but he's got versions of popular and seminal books in philosophy, sociology, science, religion, history, etc., in addition to an excellent fiction collection. Every bibliophile I've introduced to Dove and Hudson has walked out with a teetering stack of tomes to delight in reading. Bonus - for every $10 you spend, you get $1 in purple money to spend on the next visit. I am going to ditto Dove and Hudson - I have spent a lot of time in used book stores all over, and have yet to find as carefully chosen or high quality a selection as Dove and Hudson. Dove & Hudson - All of the books are of excellent quality (some even new) and the selection is great. They also have a great philosopy and political theory section - who doesn't love that? 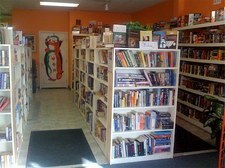 East Line Books - Great community shop with a wide selection of great literature and classics. Excellent service and friendly space. Dove & Hudson, hands down. He has a very carefully curated, yet remarkably broad, inventory. Closed each month from the 1st through the 7th. Open 6 days a week (closed on Mondays) the 8th through the end of every month. There's one in the Troy Atrium whose name escapes me now, but it's a real treasure. Shoved into a small space but the selection's incredible. I go there always to look for older stuff and have yet to come away empty-handed. Think they're open something like 10am to 4pm and during the Troy Farmer's Market. Good Buy Books in East Greenbush has a wide selection of books; they seem to skew toward the more recent. Very friendly people. I've found fantastic deals on books that are still on the best-seller list, and they also stock the all the required summer reading books and other course books for our schools. Also, a plus for the highly allergic among us -- it doesn't smell like a used book store to me. I can't browse through the musty no matter how much I would like to. It's not particularly well-curated or meticulously maintained, but the book sale on Saturday mornings at the Crossings of Colonie (same hours and time span as the farmers' market) has a nice selection for really cheap. $1 for hardback, 50 cents for paperback. Proceeds go to the Town of Colonie library. I've bought many books and donated many books. If you're willing to venture outside of Albany, you can find the best used book store, not only in the capital region, but perhaps the entire world. It's called Dog Ears Books, and according to Google Maps it's at 580 South Street, Hoosick Falls, NY (drive down Rt. 7 toward Vermont until you see the Big Moose Deli -- it's right across the road). Seriously, that's like 1/50th of what's available, and that might be a conservative estimate. Take cash as to avoid letting the King get his share. The aforementioned Dove & Hudson (make sure to take your purple moneys -- I keep mine in the glove box because I always forget). Lots of philosophy texts and lit. fic. here, not as much genre stuff. The Book Barn in Latham, whose owner is the spitting image of Major Bat Guano from Dr. Strangelove. A wide variety, with an especially fun case of vintage books (and a few shelves of early 20th C. stuff, fairly priced), and comics. Giant mystery section, if that's your thing. Tattered Page in Glenmont, well-organized but a little pricey for my used book store tastes. A very nice owner, who's always up for pleasant conversation. Book Outlet in Troy, in the same building as CVS and some gov't offices. Fair prices, an interesting variety of books. Not a lot of change in the inventory from month to month, though. Good Buy Books in Rensselaer, which I don't get to often. They have a good variety here, and a local section, which is nice. East Line Books in Clifton Park, which I find a bit pricey too, but they have a nice collection. The owner is, I gather, selective about what she purchases -- all the books are in tip-top condition, and are of some quality as books. Not a lot of trashy romance novels or dog-eared sci-fi paperbacks lying around. The owner does some community outreach -- writing classes, author signings, etc. OH, and one other note: If you're only going to be in town for Dove & Hudson, it might be best to call in advance. I can't forget the schedule, but the store is only open the last three weeks in the month, and not on Mondays? ...Or something similarly confusing for someone who drives over from Troy. Lyrical Ballad in Saratoga. Great selection in a subterranean space that's like wandering through the catacombs. You cant go wrong with Dove and Hudson. You would walk right past it if you didnt know it was there, but the selection is amazing and Dan really knows his books! I love it there. Lyrical Ballad on Phila St. in Saratoga Springs is also really great. Some of their items are pricier because they carry a lot of rare, out-of-print, and first editions but the shop is WAY bigger than you would think just from looking at the storefront so they definitely have books for all types of budgets. You can definitely spend an entire afternoon browsing - just keep walking around and you'll continue to discover new rooms full of books! Lyrical Ballad on Phila St. in Saratoga is an adventure. For more mundane reading desires, the Book Barn on Route 2 between Watervliet and Latham Circle. I'll also put in a good work for Dove and Hudson. Also Whitneys book corner in Schenectady is really good. They get most things from the Schenectady Public Library (right next door). I got the Art of Fielding (2011 bestseller) there last week for $2. East Line Books in Clifton Park. Not the place to go if you're looking for a haul of $.50 old scifi or romance novels, but there's an eclectic mix of stuff and a nice atmosphere. Robin Ringler runs the shop, and she's terrific to chat with and does run writing classes and has writers in from time to time. I forgot about Schenectady! I think Whitney's Book Corner is tied into the library, so you both get books and are contributing to the library. There's also a neat old book store right down the road from there toward Union College...I can't find it through a Google search right now, but they have lots of old books, and plenty of academic-related things, being so close to Union. There is a used bookstore right inside the Saratoga Public Library-it is fantastic! Located literally in the middle of nowhere, Roger's Book Barn (Hillsdale) and the Owl Pen (Greenwich) are favorite lazy afternoon destinations in our family. We spend a couple of hours poking around several rooms (Book Barn) and buildings (Owl Pen) and then take a walk down the lane and into the hills. The Owl Pen is somewhat pricier with more for collectors; the Book Barn is more about finding cheap reads. Down in Denver Books in Stephentown NY. Radical, history, fiction. Comfortable place to spend some time. They also do self serve. The most unusual and interesting used bookstore in the capital region is Down in Denver Books out in Stephentown. I've heard the owner call his store "the hippest bookstore between the Mississippi and the Atlantic Ocean." He's got the most unusual, eclectic group of books you'll ever see together in one store. AND the store is located in this cool, ancient farmhouse where it was once a general store back during the civil war. People who like the beat generation writers or the 1960s will love it 'cause that's kind of the them of the place, but he's got all other subjects besides. The one thing he does not have is romance novels or anything else like that - he refuses to carry that crap. East Line Books in Clifton Park carries high quality new and gently used books in all genres at discount prices and it is a wonderful gathering place where people with a love of literature/writing/reading can enjoy good company and a free cup of coffee or iced tea while relaxing at East Line Books. East Line Books hosts a monthly book club and some of the best creative writing classes in upstate New York for adults, teens and children. During the school year, they sponsor creative writing classes for homeschoolers, a poetry circle for adults, and a six-week personal essay/memoir class. I always feel kind of "re-booted" when I leave............love this place! Thanks for reminding me of Dog Ear Books! I grew up on Hoosick Falls and my grandmother lived around the corner from that place. Lots of great memories, wonderful place. It is seriously the Barnes and Noble of used book stores. Glad to see the little place in the Troy Atrium is getting some love, that place is a real gem. Yes, Dove & Hudson is hands down the best, no question.